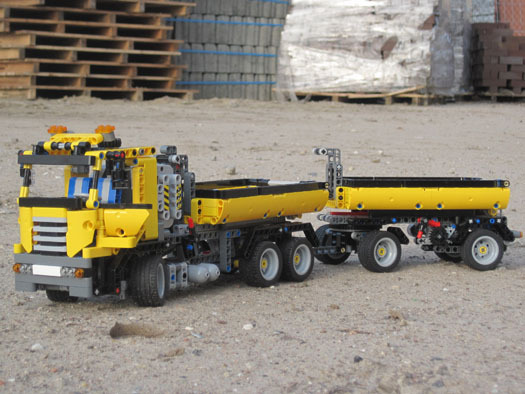 Han Crielaard developed a cute trailer for LEGO Technic set 8052, Container Truck. "In real life, a container truck carries mostly a 2nd container on a drawbar trailer. I believed that it should be possible to design a container trailer for the original set, which should be able to load and unload by the truck's lift mechanism. Because I did not want to change the original truck (just added a tow-bar), the trailer is constructed in such a way that the container can move towards the truck (or vice versa) by a 'push-pull' mechanism. In reality this is not the case, but unavoidable by an unmodified original truck." As usual, Han put a lot of effort preparing very professional looking building instructions. There is also a complete part list for the 8052 Container Trailer. It can be found in the Excel part list inventory. As well, a Bricklink XML file is available for a 'Wanted list mass upload' inventory on BrickLink. Of course you will find it all, at the Technic LEGO® site of Han. Unfortunately didn't found a link for the trailer page that also displays the left side navigation bar. However you may jump in, directly from here. For the case you have not yet seen Han's huge Truck 8x4 with Detachable Lowloader, that he designed in 2010, you may find it also here. Or the respective YT video here. I was thinking how the truck's arm could load a container into the far away trailer without modifications, but then noticed the clever and mechanically simple solution: it loads the container into it without the trailer, hooks up to the trailer, passes the container to the trailer, unhooks from the trailer, loads the 2nd container into it, and re-hooks up to the trailer.